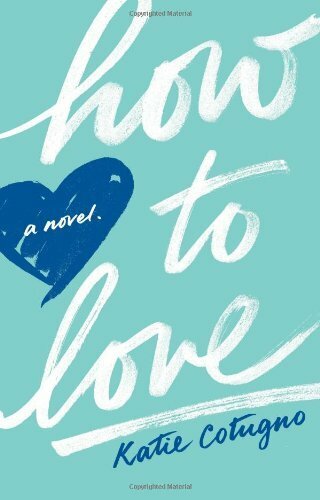 I don’t make too many jaunts into Young Adult, but Nook was offering a deal on Katie Cotugno’s new novel How to Love and I decided to take a chance. I was glad I did. Lately I’ve been looking for well-crafted novels that keep me glued to the page, waiting to see what happens next, and this book definitely kept me up into the night! How to Love features some great teenage angst, but there’s an element of the adult world too as the main character deals with an unplanned pregnancy at the age of seventeen. I loved the interesting, honest treatment of this kind of situation, and I respected the character’s choices in that she decided to have and raise her baby. Reena’s anger, guilt, and bitterness stemming from the missed opportunities caused by this pregnancy struck me as really realistic, and it was painful (but very honest) to read how she had to reconcile giving up some of her life goals to raise her child. Now I’ve made the book sound like a major downer: it’s not at all! To that point, the developments in Reena’s life toward the end of the novel are very satisfying. But I did really appreciate the honesty and realism: I’ll always endorse a book that doesn’t glamorize teen pregnancy in the slightest (side-eye to you, MTV). The unique device in How to Love is the switch between “Before” and “After” (the pregnancy). Though the baby is a major part of the story, mainly it’s a love story between Reena and Sawyer, the father of her child. Sawyer is not a perfect character, as you’ll see in so many YA romances, and I found myself at different times rooting for and against him. The author did a fantastic job of writing complex, realistic characters, and that gave this book a lot more depth than it could have had. The writing was also very good; you could tell the author has quite the command of imagery and mood. Though I could have done without most of the expletives (seemed a little forced to me, like the author was trying to modernize these characters, but all it did was water down the overall effectiveness of her writing), I still think the story has a lot of merit in terms of discussion topics and just some angsty, juicy reading. Made me look fondly back at being a teenager but also feel extremely glad I’m an adult now, and as I approach the big 3-0, I can definitely appreciate that.